Out of all his toys, one of the surprise hits so far has been the Baby Tap-A-Tune Piano, by Little Tikes. 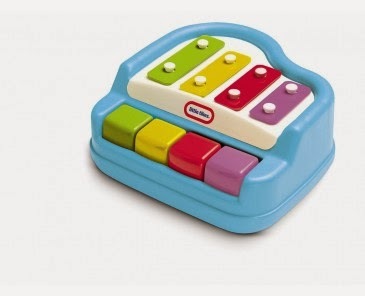 Official product description: this toy piano will delight and stimulate your baby! It is just the right size for little hands, and the keys are easy to press. Babies will learn cause and effect, and begin to develop a sense of rhythm and timing. It's basically a modern take on a xylophone, but without all the faffing around having to hit it with a stick. So it's very much suitable for infants as they can still get the hang of it very quickly and produce pleasing, stimulating sounds. Both baby C and I can't get enough of it. We will quite happily sit there tinkering with it, playing tunes. C will bash it with his little fists while I attempt to restore order with wondrous jazz solos and improvisations. It's amazing what can be achieved with just four notes and you can come up with lovely chord combinations. Sadly, my wife doesn't share the same views. She absolutely hates it when I play it, whereas she coos and claps for the baby every time he produces the slightest plink from it. I can see this being a long term hit with C and at 7 months old he is already starting to develop his motor skills by swinging a wooden spoon at it. He is just about starting to sit up unassisted but even when he's in his Bumbo seat he is often leaning over the side trying to reach at the piano all the time. It's so cute to watch. He's at the age where he is learning cause and effect. Poor Sophie the Giraffe learned this to her detriment when she became an unlucky participant in C's recent orchestra. Looking very pleased with himself, he whacked her repeatedly against the robust keys of the piano until her squeak lost a bit of its sparkle. (I may post a video of this later). A great toy! Just as good for parents as it is for kids, and highly interactive and educational. Seems to be well built and sturdy, with a strong plastic casing. I'll be really interested to see what he can do with it as he gets older. 5 stars - highly recommended.